3 Bedroom Terraced House For Sale in Nottingham for Asking Price £180,000. 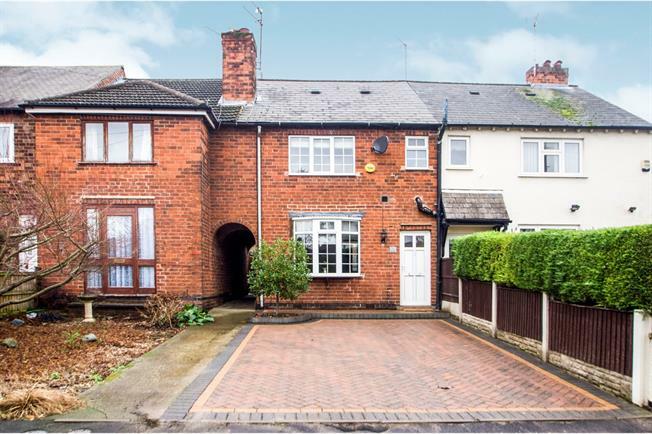 Immaculately presented traditional three bedroom property situated in a quiet location close to Sandiacre canal. The property benefits from off road parking to the front and a good size garden to the rear. In brief the accommodation comprises of entrance hall, lounge, kitchen/diner. To the first floor there are three bedrooms and a newly fitted family bathroom. To the front of the property is block paved driveway providing off road parking for two cars.. Rolled edge work surface, built-in wall and base units, single sink with drainer, space for free standing oven, integrated dishwasher, plumbing for washing machine, space for fridge/freezer, wall mounted boiler, double glazed uPVC door and window facing the rear, radiator, tiled flooring, under stairs storage cupboard. Newly fitted bathroom, low level WC, double enclosure shower, wall-mounted sink, double glazed uPVC window facing the front, heated towel rail. Block paved driveway to the front of the property providing off road parking for two cars. Enclosed rear garden which is mostly laid to lawn with a decked patio area and garden shed.